Germany says it does not expect Turkish security agents who were charged for violent scuffles in Washington last month to join President Recep Tayyip Erdogan in a G20 summit next week. A spokesman said leaders can bring their own bodyguards to the summit in Hamburg, but the law must be respected. A list of Turkish officials expected to travel to the event reportedly included several people involved in the brawl. US prosecutors charged 12 agents with assault last week for the incident. 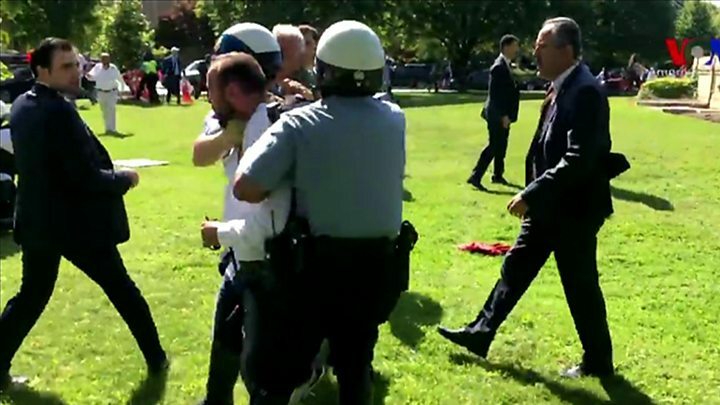 Police called it a "brutal attack" on protesters by Turkish security personnel, but Turkey blamed the violence on pro-Kurdish demonstrators who were outside the Turkish ambassador's residence in Washington. The case strained US-Turkey relations and could inflict more damage on already soured relations between Ankara and Berlin, correspondents say. Germany's foreign ministry spokesman Martin Schaefer said: "I have reason to expect that these people, who have been incriminated by the American criminal justice (system) will not step onto German soil in the foreseeable future, including during the G20 summit." German media reported that a list of 50 people who were expected to accompany Mr Erdogan included agents that had participated in the incident. In response, German authorities told Turkey to not bring those security personnel, newspaper Die Welt reports (in German). Officials say they expect violent protests during the summit, to be held on 7 and 8 July. Some 15,000 security agents are expected to be deployed in Hamburg.